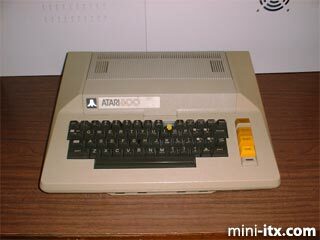 The Atari 800 was my first love. The year was 1982, and the specs were cutting-edge: 1.79 MHz, 48K of RAM (should be enough for almost anything, right?) Well, after years of playing games, times changed and I had graduated on to bigger, faster, sexier computers. The Atari went into the closet...then eventually faded and disappeared. Flash forward to 2000. I've missed that clunky old Atari. Well, after a chance meeting with an elderly gentleman, I came into a very large quantity of free Atari gear that he had been hoarding and wanted to donate to "a loving home". I've been reveling in nostalgia ever since. There has always been a cult community of Atari 8-bit enthusiasts, keeping the platform alive, and even developing some very interesting new technologies that allow interface to modern PCs and peripherals. Here's the perfect donor unit: dirty, a little beaten up, missing keyboard keys, unable to boot up. The first step was to completely gut the unit, and throw away the internals. 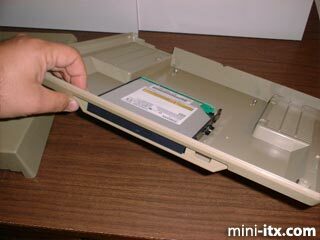 I realized immediately that there would be a few logistical challenges, as the inside of the atari case is not linear. As you can see in the picture, there are steps and angles, as well as support pillars all over the upper half of the case. The first thing I did was to use a Dremel tool to mill out a slot for a notebook-style CD burner. 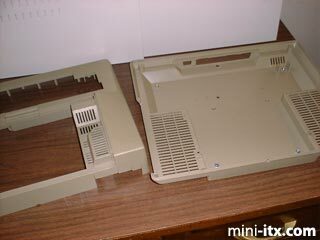 The Atari has four 9-pin joystick slots on the lower front of the case. Three of these are just wide enough for a standard notebook CDR. 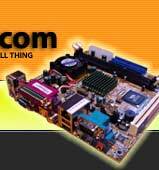 I also required a self-contained power supply, particularly well-suited for ITX in set-top DVD type applications. I found a nice unit from PC Power and Cooling. I decided on the best location for this power supply, then set about to milling out holes in the case to accomodate the rear panel, and to cut out the case support pillars to fit the power box inside snugly. 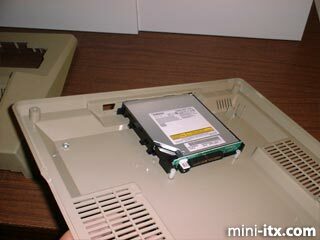 I got my hands on a Samsung CDRW/DVD drive that came complete with mounting plate and integral IDE connector adapter. The first test fitting was perfect. Due to the shape of the case, I had to figure out how to suspend the rear-end of the CDR about 8mm above the floor of the case. I decided that a simple but effective solution would be to mount nylon standoff posts with narrow slots cut out to hold the rear of the mounting plate. Perfect--sturdy enough and lightweight. 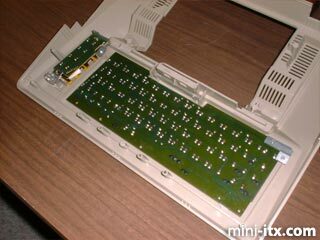 The Atari's keyboard was going to be a major problem. The 800's keyboard assembly is huge and heavy. It literally occupies the entire front end of the case (exactly where the CDR is now sitting). At first, I wasn't sure how I was going to solve this. First, I thought I might find a notebook PC keyboard that might fit in that space, but that proved to be highly impractical for several reasons (I won't bore you with the details). 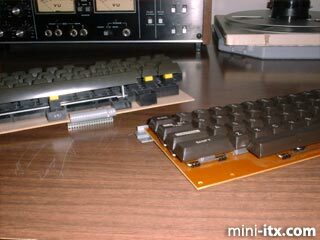 As it turns out, the later model Ataris (XL series) used a totally different keyboard that was wider, but very slim. This would work as a replacement, but it would have to be a non-functional facade.